Örsan K. Öymen: FMV Işık Üniversitesi İnsan ve Toplum Bilimleri Bölümü Başkanı (Profesör), Felsefe Sanat Bilim Derneği Kurucu Üyesi ve Yönetim Kurulu Başkanı, Assos'ta Felsefe projesi Kurucusu ve Direktörü. Lisans ve Doktora derecesini Orta Doğu Teknik Üniversitesi Felsefe Bölümü'nden, Yüksek Lisans derecesini New York Üniversitesi (NYU) Felsefe Bölümü'nden aldı. İlgi ve çalışma alanları: Epistemoloji, Etik, Siyaset Felsefesi, Herakleitos, Protagoras, Gorgias, Sokrates, Platon, Epikuros, Piron, Sextus, Descartes, Locke, Hume, Nietzsche, Marx ve Sartre. Hume, Tanrı Var mıdır? ve Varlık ve Kuşku (yayına hazırlanmakta) kitaplarının ve alanında birçok makalenin yazarıdır. Türker Armaner: Galatasaray Üniversitesi Felsefe Bölümü Başkanı. (Profesör). Lisans derecesini Hacettepe Üniversitesi Felsefe Bölümünden, Yüksek Lisans derecesini Boğaziçi Üniversitesi Felsefe Bölümünden, Doktora derecesini Paris Saint Dennis VIII Üniversitesi Felsefe Bölümünden aldı. İlgi ve çalışma alanları: Estetik, Siyaset Felsefesi, 19. Yüzyıl Felsefesi, Spinoza, Hegel, Fichte, Schopenhauer, Marx, Kierkegaard. Dalgakıran, Taş Hücre, Kıyısız (kısa öykü), Tahta Saplı Bıçak, Hüküm (roman) ve Tarih ve Temsil kitaplarının ve alanında birçok makalenin yazarıdır. Halil Turan: Orta Doğu Teknik Üniversitesi Felsefe Bölümü Başkanı (Profesör). Lisans derecesini Orta Doğu Teknik Üniversitesi Fizik Bölümünden, Yüksek Lisans ve Doktora derecelerini Orta Doğu Teknik Üniversitesi Felsefe Bölümünden aldı. İlgi ve çalışma alanları: Epistemoloji, Bilim Felsefesi, Ontoloji, Etik, Siyaset Felsefesi, Descartes, Locke, Rousseau, Hume, Kant, Kuhn. Mantık Terimleri Sözlüğü kitabının (Teo Grünberg, David Grünberg ve Adnan Onart ile birlikte) ve alanında birçok makalenin yazarıdır. Doğan Göçmen: Dokuz Eylül Üniversitesi Felsefe Bölümü Öğretim Üyesi (Profesör). Lisans derecesini Hamburg Üniversitesi Sosyoloji Bölümünden, Doktora derecesini Edinburgh Üniversitesi Sosyal Bilimler Enstitüsünden Felsefe alanında aldı. İlgi ve çalışma alanları: Siyaset Felsefesi, Ekonomi Felsefesi, Hobbes, Adam Smith, Kant, Hegel, Marx, Husserl. Modern Felsefe: Tarihsel Anlamı, Güncel Mirası; Adam Smith, Hegel ve Marx ve The Adam Smith Problem: Reconciling Human Nature and Society in the Theory of Moral Sentiments and Wealth of Nations kitaplarının ve alanında birçok makalenin yazarıdır. Nazile Kalaycı: Hacettepe Üniversitesi Felsefe Bölümü Öğretim Üyesi (Profesör). Yüksek Lisans ve Doktora derecelerini Hacettepe Üniversitesi Felsefe Bölümünden aldı. İlgi ve çalışma alanları: Siyaset Felsefesi, Etik, Ontoloji, Antik Yunan Felsefesi, Platon, Aristoteles, Spinoza, Hegel, Marx, Nietzsche, Habermas, Heidegger, Gadamer. Klasik Düşüncelerin İzinde Güncel Politika Sorunları kitabının ve alanında birçok makalenin yazarıdır. Cemil Güzey: Mimar Sinan Üniversitesi Felsefe Bölümü Öğretim Üyesi (Doçent). Lisans, Yüksek Lisans ve Doktora derecelerini İstanbul Üniversitesi Felsefe Bölümünden aldı. İlgi ve çalışma alanları: Ontoloji, Etik, Estetik, Mantık, Dil Felsefesi, Herakleitos, Epiktetos, Aurelius, Hobbes, Nietzsche, Wittgenstein, Hartmann. Alanında birçok makalenin yazarıdır. Barış Parkan: Orta Doğu Teknik Üniversitesi Felsefe Bölümü Öğretim Üyesi (Doçent). Lisans derecesini Bennington Koleji Felsefe Bölümünden, Yüksek Lisans derecesini Milwaukee Wisconsin Üniversitesi Felsefe Bölümünden, Doktora derecesini Texas Üniversitesi (Austin) Felsefe Bölümünden aldı. İlgi ve çalışma alanları: Siyaset Felsefesi, Etik, Uygulamalı Etik, Ontoloji, Marx, Hegel, Whitehead. Marx kitabının ve alanında birçok makalenin yazarıdır. Meeting at the Athena Temple / Blue waters, wine, sunset. What is the relation between life and philosophy? Must epistemology justify or search for the foundations of knowledge? Blue waters, wine and sunset. Tuncay Yılmaz plays Johann Sebastian Bach in the Ancient Theater under full moon. Visit the ruins of Troy & dinner in Sütlüce by the sea. David Cooper: Durham University Department of Philosophy. Special areas of interest: European philosophy, aesthetics, philosophy and the environment, realism and anti-realism. Author of "Existentialism: A Reconstruction" (Blackwell), "Heidegger" (Claridge), "World Philosophies" (Blackwell); editor of "Aesthetics: The Classic Readings", "Ethics: The Classic Readings", "Epistemology: The Classic Readings" and "Metaphysics: The Classic Readings". (All from Blackwell). Asa Kasher: Tel Aviv University Department of Philosophy. Special areas of interest: ethics, philosophy of life, and the philosophy of language. Author of "Spirit of a Man", "Meaning of Life", "Virtues and Emotions"; editor of "The Chomskyan Turn" (Blackwell). Editor in Chief of the Israeli philosophy journal "Philosophia". Ahmet İnam: Middle East Technical University Department of Philosophy. Special areas of interest: Ethics, epistemology, philosophy of science, philosophy of the environment and culture. Author of "What Is Technology For Me? ", "From Imagination to Thought" and "Logic In Edmund Husserl's Philosophy". Amihud Gilead: Haifa University Department of Philosophy. Special areas of interest: Plato, Spinoza, Kant, the philosophy of mind. Author of "The Way of Spinoza's Philosophy Towards A Philosophical System", "The Platonic Odyssey: A Philosophical-Literary Inquiry Into Phaedo" and "Saving Possibilities: A Study In Philosophical Psychology". Brian Elliott: University College Dublin Department of Philosophy. Special areas of interest: Phenomenology, existentialism, philosophy of the imagination, Heidegger, Aristoteles and Kant. Stephen Laurence: Teaching at the Department of Philosophy at the University of Sheffield / UK. Area of interest and research: Philosophy of mind, cognitive science and metaphysics. Director of the Innateness and the Structure of the Mind project and the Hang Seng Centre for Cognitive Science. Editor of the books titled Contemporary Readings in the Foundation of Metaphysics (Blackwell, 1998), Concepts: Core Readings (MIT Press, 1999) and Creations of the Mind (Oxford University Pres, 2003). Geraldine Coggins: Teaching at the Department of Philosophy at the University of Aberdeen / UK. Completed her Ph.D at Durham University. Area of interest and research: Analytic philosophy and metaphysics. Her article World and Object: Metaphysical Nihilism and Three Accounts of Worlds was published in 2003 in the Proceedings of the Aristotelian Society. Walter Cavini: Teaching at the Department of Philosophy at the University of Bologna / Italy. Areas of interest and research: Ancient Greek philosophy, Aristotle and the Stoics. Author of various articles and contributer to various books written in this field. Paul van Tongeren: Teaching at the Department of Philosophy at Nijmegen University / Holland. Area of interest and research: Ethics and Nietzsches philosophy. Author of the book titled Reinterpreting Modern Culture: An Introduction to Friedrich Nietzsches Philosophy. President of the Center for Ethics (CEKUN) in Holland. Julia Annas: University of Arizona Department of Philosophy. Special areas of interest: Ancient philosophy. Author of "Aristotle's Metaphysics M & N" (Oxford Un. Press), "An Introduction to Plato's Republic" (Oxford Un. Press), "Hellenistic Philosophy of Mind" (Un.of California Press), "The Morality of Happiness" (Oxford Un. Press), "Platonic Ethics, Old & New" (Cornell Un. Press), "Ancient Philosophy" (Oxford Un. Press) and "Plato" (Oxford Un. Press). Gisela Striker: Harvard University Department of Philosophy. Special areas of interest: Ancient philosophy, Plato, Aristotle, the Stoics, Epicureans and the Sceptics. Author of various articles in these areas. Her essays on Hellenistic philosophy were gathered in a book titled "Essays on Hellenistic Epistemology and Ethics" (Cambridge University Press). James Allen: University of Pittsburgh Department of Philosophy. Special areas of interest: Ancient and Hellenistic philosophy. Author of "Inference From Signs: Ancient Debates About the Nature of Evidence" (Oxford Un. Press) as well as of various articles in this area. Richard Bett: John Hopkins University Department of Philosophy. Special areas of interest: Ancient philosophy, ethics, epistemology, ancient and modern scepticism, Nietzsche. Author of "Pyrrho, His Antecedents and His Legacy" as well as of various articles in this area. Walter Cavini: University of Bologna Department of Philosophy. Special areas of interest: Ancient philosophy, Aristotle and the Stoics. Author of various articles in this area and contributer to various books written in this field. Brian Elliott: He received his MA degree from the University of Edinburgh (UK) and his PhD degree from the University of Freiburg (Germany). Areas of interest and research: Aesthetics, 20th century German philosophy, Edmund Husserl and Martin Heidegger. Besides being the author of various articles in his area, he is the author of The Beginning and End of Philosophy (Anfang und Ende der Philosophie / Duncker & Humblot, Berlin, 2002) and Phenomenology and Imagination in Husserl and Heidegger / Routledge, 2005. He teaches at the University College Dublin (Ireland). Matthias Bormuth: He received his MA/PhD degree from the University of Tubingen and the University of Heidelberg (Germany). Areas of interest and research: Medical Ethics, History of Psychiatry and Psyhoanalysis, History of Philosophical Hermeneutics, Ethics, Karl Jaspers, Friedrich Nietzsche, Max Weber, Karl Lowith. He is the author of various articles in his field as well as of the award winning book titled Lifeconduct in Modern Times. Karl Jaspers and Psychoanalysis (Lebensfuhrung in der Moderne. Karl Jaspers und die Psychoanalyse / Fromman-Holzboog, 2002) which has also been translated into the English and will be published in the USA in the Fall of 2005 by Springer International Publishers / New York. He teaches at the University of Tubingen at the Institute for Ethics and the History of Medicine. Orsan K. Oymen: He received his MA degree from New York University (USA) and his PhD degree from the Middle East Technical University (Turkey). Areas of interest and research: Epistemology, Ethics, Scepticism, Subjectivism, Existentialism, Sextus Empiricus, David Hume, Friedrich Nietzsche, Soren Kierkegaard, Martin Heidegger, Jean Paul Sartre and Karl Marx. Author of various articles in his field. Founder and Director of Philosophy in Assos. He teaches at Bahcesehir University (Turkey) Department of Philosophy. Orly Shenker: She received her MA and PhD degrees from the Hebrew University of Jerusalem (Israel). Areas of interest and research: Philosophy of Science, Philosophy of Physics, Applied Ethics. Author of various articles in her field. She taught at the London School of Economics and is currently teaching at the Open University of Israel (Israel). Sylvana Chrysakopoulou: She received her MA/PhD degrees from Sorbonne University (France). Areas of interest and research: The Pre-Socratic philosophers, particularly Empedocles and Xenophanes, Theology and Physics in the Ancient period. Teaching at the University of Patras (Greece) Department of Philosophy. David Owen: University of Arizona, Department of Philosophy. Areas of interest and research: Early Modern Philosophy, Descartes, Locke, Hume; metaphysics, problems of reasoning, theories of judgment in 17th and 18th century. Author of Humes Reason (Oxford University Press, 1999) as well as of numerous articles. Tito Magri: University of Rome La Sapienze, Department of Philosophy. Areas of interest and research: Practical Philosophy, Ethics, Political Philosophy, Philosophy of Emotions, Philosophy of Psychology, Theories of Imagination; Hobbes, Locke, Hume; Practical Philosophy in Aristotle and Kant. Author of various books and articles in his field. Colin Howson: London School of Economics, Department of Philosophy. Areas of interest and research: Philosophy of Science and the foundations of probability. Author of Hume's Problem: Induction and the Justification of Belief (Oxford University Press, 2000) and Scientific Reasoning: the Bayesian Approach (with Peter Urbach / Open Court Publishing Company, 1989) as well as of numerous articles. President of the British Society for the Philosophy of Science (2003-2005). Don Garrett: New York University, Department of Philosophy. Areas of interest and research: Early Modern Philosophy, metaphysics, epistemology, philosophy of mind, ethics. Author of Cognition and Commitment in Humes Philosophy (Oxford University Press, 1997) as well as of numerous articles and chapters in various books. "The Concept of Happiness in Ancient Philosophy and Contemporary Ethics"
Christoph Rapp: Humboldt University Department of Philosophy. Area of research and interest: Ancient Philosophy. Author of the books Identität, Persistenz und Substantialität. Untersuchung über das Verhältnis von sortalen Termen und Aristotelischer Substanz, Aristoteles, Metaphysik. Die Substanzbücher (Zêta, Êta, Thêta), Vorsokratiker,Aristoteles zur Einführung (mit Christoph Horn), Wörterbuch der antiken Philosophie (mit Christoph Horn) as well as of various articles and editor of various books in his field. Christoph Horn: Bonn University Department of Philosophy. Area of research and interest: Ancient Philosophy, Medieval Philosophy, Ethics, Political Philosophy. Author of the books Plotin über Sein, Zahl und Einheit. Eine Studie zu den systematischen Grundlagen der Enneaden, Paradigmen mittelalterlicher Philosophie, Antike Lebenskunst. Glück und Moral von Sokrates bis zu den Neuplatonikern, Einführung in die Politische Philosophie Grundlegende Güter. Untersuchungen zu einer handlungsteleologischen Ethik as well as of various articles and editor of various books in his field. Pierre Destree: University of Louvain-la-Neuve Department of Philosophy. Area of research and interest: Ancient Philosophy. Author of various articles and editor of various books in his field. Anthony Price: Birbeck College London Department of Philosophy. Area of research and interest: Ancient Philosophy. Author of the books Mental Conflict, Love and Friendship in Plato and Aristotle as well as of various articles and editor of various books in his field. Christopher Shields: Oxford University Department of Philosophy. Area of research and interest: Ancient and Medieval Philosophy. Author of the books Aristotle, Classical Philosophy: A Contemporary Introduction , The Philosophy of Thomas Aquinas (with Robert Pasnau), Order in Multiplicity: Homonymy in the Philosophy of Aristotle as well as of various articles and editor of various books in his field. Dan Russell: Monash University Department of Philosophy. Area of research and interest: Ancient and Modern Philosophy. Author of the book Plato on Pleasure and the Good Life as well as of various articles and editor of various books in his field. Philipp Brüllmann: Humboldt University Department of Philosophy. Area of research and interest: Ancient Philosophy. Author of various articles and editor of various books in his field. Christopher Gill: University of Exeter Department of Philosophy. Area of research and interest: Ancient Philosophy. Author of the books Greek Thought: Greece and Rome New Surveys in the Classics, Personality in Greek Epic, Tragedy and Philosophy: The Self in Dialogue, The Structured Self in Hellenistic and Roman Thought as well as of various articles and editor of various books in his field. Richard Bett: John Hopkins University Department of Philosophy. Area of research and interest: Ancient Philosophy. Author of the book Pyrrho, his Antecedents and his Legacy as well as of various articles and editor of various books in his field. Walter Cavini: University of Bologna Department of Philosophy. Area of research and interest: Ancient Philosophy. Author of various articles and sections in books and editor of various books in his field. Jean Salem: University of Paris 1 Sorbonne Department of Philosophy. Area of research and interest: Ancient Philosophy, Ethics, Political Philosophy. Author of the books Le Bonheur ou LArt dêtre heureux par gros temps, Philosophie de Maupassant, Cinq variations sur le plaisir, la sagesse et la mort. Karl Marx, Manuscrits de 1844, Démocrite. Grains de poussière dans un rayon de soleil, La Mort nest rien pour nous. Lucrèce et léthique, Tel un dieu parmi les hommes. Léthique dÉpicure as well as of various articles and editor of various books in his field. Amber Carpenter: University of St-Andrews Department of Philosophy. Area of research and interest: Ancient Philosophy. Author of various articles and editor of various books in her field. 16:00 Clare Carlisle (University of Liverpool): "Lost in Thought: Kierkegaard's Despair in the Age of Reflection"
18:00 Marc Sinclair (Manchester Metropolitan University): "The Alien and the Uncanny: Heidegger, Marx and the Question Concerning Technology"
14:00 Ulrich Steinvorth (Bilkent University): "Alienation, World and Life in Hannah Arendt"
16:00 Iddo Landau (University of Haifa): "Alienation and the Meaning of Life in Camus"
18:00 Keith Crome (Manchester Metropolitan University): "Existential Alienation in Merleau-Ponty"
Ulrich Haase: Manchester Metropolitan University Department of Philosophy. Area of interest and research: Existentialism, Nietzsche, Sartre, Kant, Merleau-Ponty and Philosophy of Literature. Editor of the Journal of the British Society for Phenomenology. Author of numerous articles and the book Maurice Blanchot (Routledge, 2001). Clare Carlisle: University of Liverpool Department of Philosophy. Area of interest and research: Kierkegaard, Philosophy of Habit, Philosophy of Religion. Author of numerous articles and the books Kierkegaard: A Guide for the Perplexed (Continiuum Press, 2006), Kierkegaards Philosophy of Becoming: Movements and Positions (State University of New York Press, 2005). Marc Sinclair: Manchester Metropolitan University Department of Philosophy. Area of interest and research: Ethics, Phenomenology, Aesthetics, Ancient Greek Philosophy, Heidegger. Author of various articles. Ulrich Steinvorth: Bilkent University Department of Philosophy. Area of interest and research: Political Philosophy, Ethics, Metaphysics. Author of various articles and the books Without Docks: How Fundamentalists and Philosophers Respond to Human Fallibility (Mentis, 2006), Classical & Modern Ethics (LHarmattan, 2003). Iddo landau: University of Haifa Department of Philosophy. Area of interest and research: Feminism, Existentialism, Philosophy and Film. Author of numerous articles and the book Is Philosophy Androcentric? (Penn State University Press, 2006). Keith Crome: Manchester Metropolitan University Department of Philosophy. Area of interest and research: 20th Century French Philosophy, Existentialism, Phenomenology, Ancient Greek Philosophy. Author of numerous articles and the book Lyotard and Greek Thought: Sophistry (Palgrave MacMillan, 2004). Jan Robert Bloch: Potsdam University Department of Sociology and Economics. Areas of interest and research: Ethics, Political Philosophy, Philosophy of Nature, Philosophy of Science, Non-Linear Systems in Chemistry and Physics. Author of the books "Andere Ansichtern der Natur" (SZD Verlag, 1981), "Natur und Arbeit" (Beltz Verlag, 1982), "Wachstum der Grenzen" (Sendler Verlag, 1984)), "Naturwissenschaftlische Fachsystematik und Curriculum" (Beltz Verlag, 1984), "Kristalle der Utopie" (Tahlheimer Verlag, 1995), "Utopie: Ortsbestimmung im Nirgendwo" (Verlag Leske, 1997), "Perspektiven der Philosophie Ernst Bloch's" (Suhrkamp Verlag, 1999) and of numerous articles in his field. He is the founding member of the Ernst Bloch Foundation. Alan Carter: University of Glasgow Department of Philosophy. Chair of Moral Philosophy at Glasgow, a position which was hold previously by Adam Smith, Francis Hutcheson and Thomas Reid. Areas of interest and research: Ethics, Political Philosophy, Philosophy of the Environment. Author of the books Marx: A Radical Critique (Westview Press, 1988), The Philosophical Foundations of Property Rights (Hemel Hempstead, 1989) and A Radical Green Political Theory (Routledge, 1999) as well as of over 50 articles in his field. Sandrine Berges: Bilkent University Department of Philosophy. Areas of research and interest: Ancient Greek Philosophy, Ethics, Friedrich Nietzsche. She is the author of the book (to be published) "Plato, Virtue and the Law" and of various articles in her field. Minou Friele: Heinrich-Heine University Düsseldorf Department of Philosophy; member of the Oxford University Uehiro Center for Practical Ethics. Areas of interest and research: Applied Ethics, Bio-Ethics, Public Health Ethics, Business Ethics, Philosophy of Law, Political Philosophy. Author of the books Rechtsethik der Embryoenforschung (Mentis Verlag, 2008) and Embryo Research in Pluralistic Europe (Springer Verlag, 2003) as well as of various articles in her field. Orly Shenker: Open University of Israel Department of Philosophy. Areas of research and interest: Philosophy of Science, Epistemology, Applied Ethics. Author of the books (to be published) Bio-Ethics: A Methodological Introduction and The Sociological Turn: Sociology of Scientific Knowledge and Social Construction of Scientific Facts, as well as of various articles in her field. Dorothea Frede: University of California at Berkeley, Department of Philosophy. Her areas of research are: Metaphysics, Ethics, Ancient Philosophy, Plato, Aristotle and Heidegger. She is the author of the books Plato / Philebus, Ernst Cassiers Werk und Wirkung, Traditions of Theology, Forschungsfreiheit und Ihre Ethischen Grenzen, Language and Learning as well as of numerous articles. Michael Pakaluk: The Institute for the Psychological Sciences at Arlington. His areas of research are: Ancient Philosophy, Ethics, Political Philosophy, Philosophical Psychology, Philosophical Logic and Aristotle. He is the author of the books Aristotles Nichomachean Ethics: An Introduction, Aristotelian Theory of Action and Moral Psychology (with Giles Pearson) as well as of numerous articles. Walter Cavini: University of Bologna Department of Philosophy. His areas of research are: Ancient Philosophy, Plato, Aristotle, the Stoics, Sextus Empiricus and Ludwig Wittgenstein. He is the author of numerous articles and chapters in books. Pierre Destree: University of Louvain Department of Philosophy. His areas of research are: Ancient Philosophy, Plato, Aristotle, Ethics and Aesthetics. He is the author of the books (to be published) Socrate, Linvention de lEthique Grecque, Aristote / La Poetique, Plato and Aristotle on Poetry as well as of numerous articles. Andres Rosler: University of Buenos Aires Department of Philosophy. His areas of research are: Political Philosophy, Contemporary Political and Legal Theory, Aristotle. He is the author of the book Political Authority and Obligation in Aristotle and Thomas Hobbes / De Cive as well as of numerous articles. Marguerite Deslauriers: University of McGill Department of Philosophy. Her areas of research are: Ancient Philosophy, History of Philosophy, Feminist Philosophy. She is the author of the book Aristotle on Definition as well as of numerous articles. Marco Zingano: University of Sao Paulo Department of Philosophy. His areas of research are: Ancient Philosophy, Aristotle and Kant. He is the author of the books Reason As History in Kant, Reason and Perception in Aristotle, Essays on Ancient Ethics, Aristotle on Moral Virtue as well as of numerous articles. Christoph Horn: University of Bonn Department of Philosophy. His area of research are: Plato, Aristotle, Kant, Ethics and Political Philosophy. He is the author of the books Augustinus / De Cevitate Dei, Wörterbuch der Antiken Philosophie (with Christof Rapp), Philosophie der Gerechtigkeit (with Nico Scarano), Groundwork for the Metaphysics of Morals (with Dieter Schönecker) as well as of numerous articles. Antony Hatzistavrou: University of Hull Department of Philosophy. His areas of research are: Ancient Philosophy, Ethics, Political Philosophy, Philosophy of Action. He is the author of various articles in his field. Karen Nielsen: University of Western Ontario Department of Philosophy. Her areas of research are: Ancient Philosophy, Ethics, Theory of Action. She is the author of various articles in her field. Simon Blackburn: Cambridge University Department of Philosophy. (Chairman / Professor). Area of interest and research: Metaphysics, Ethics, Philosophy of Mind, Philosophy of Language, Hume, Plato. He is the author of the books Spreading the Word, Essay in Quasi-Realism, The Oxford Dictionary of Philosophy, Ruling Passions, Think, Being Good, Lust, Hume, Platos Republic and also of numerous articles in his field. Stephen Darwall: Yale University Department of Philosophy. (Professor). Area of interest and research: Ethics, Political Philosophy, Hume. He is the author of the books Impartial Reason, The British Moralists and the Internal Ought , Philosophical Ethics, Welfare and Rational Care, The Second-Person Standpoint: Respect, Morality and Accountability and also of numerous articles in his field. John Prentice Wright: Central Michigan University Department of Philosophy. (Professor). Area of interest and research: Metaphysics, Epistemology, Ethics, Hume, Locke. He is the author of the books Humes A Treatise of Human Nature: An Introduction, David Hume. A Treatise of Human Nature, The Sceptical Realism of David Hume and also of numerous articles in his field. David Owen: University of Arizona Department of Philosophy. (Associate Professor). Area of interest and research: Epistemology, Ethics, Descartes, Locke, Hume. He is the author of the book Humes Reason and also of numerous articles in his field. Don Garrett: New York University (NYU) Department of Philosophy. (Chairman / Professor). Area of interest and research: Metaphysics, Epistemology, Ethics, Philosophy of Mind, Descartes, Spinoza, Locke, Hume. He is the author of the book Cognition and Commitment in Humes Philosophy and also of numerous articles in his field. William Edward Morris: Illinois Wesleyan University Department of Philosophy. (Professor). Area of interest and research: Epistemology, Metaphysics, Philosophy of Religion, Hume. He is the author of the book Starting With Hume (with Charlotte Brown) and also of numerous articles in his field. Charlotte Brown: Illinois Wesleyan University Department of Philosophy. (Associate Professor). Area of interest and research: Ethics, Political Philosophy, Hume. She is the author of the book Starting With Hume (with William Edward Morris) and also of numerous articles in her field. Michael B. Gill: University of Arizona Department of Philosophy. (Associate Professor). Area of interest and research: Ethics, Political Philosophy, Locke, Hobbes, Hume. He is the author of The British Moralists on Human Nature and the Birth of Secular Ethics and also of numerous articles in his field. Tito Magri: University of Roma La Sapienza Department of Philosophy. (Professor). Area of interest and research: Epistemology, Ethics, Political Philosophy, Hume. He is the author of the book Contratto e Convenzione and also of numerous articles in his field. Örsan K. Öymen: Bahcesehir University (Istanbul) Graduate Programme for Philosophy. (Associate Professor). Area of interest and research: Epistemology, Ethics, Sextus, Hume, Nietzsche. He is the author of the book Hume and also of numerous articles in his field. He is founder and director of Philosophy in Assos and also President of the Association of Philosophy, Art & Science. Pascal Engel: University of Geneva Department of Philosophy. Areas of interest and research: Philosophy of Mind, Philosophy of Language, Philosophy of Logic, Epistemology. He is the author of the books The Norm of Truth, Davidson et la Philosophie du Langage, Introduction à la Philosophie de Lesprit, Philosophie et Psychologie, La Dispute, Truth, Ramsey, Truth and Success (with Jérôme Dokic), A Quoi Bon la Vérité? (with Richard Rorty), Va savoir! and also of numerous articles in his field. Ivan Soll: University of Wisconsin-Madison Department of Philosophy. His areas of interest and research: Ethics, Aesthetics, Existentialism, Nietzsche, Sartre, Freud, Hegel. He is the author of "Introduction to Hegel's Metaphysics" and of numerous articles in his field. Toni Ronnow-Rasmussen: Lund University Department of Philosophy. Areas of interest and research: Ethics and Value Theory. He is the author of the books Personal Value and Logic, Fact and Representation and also of numerous articles in his field. Fulvia De Luise: University of Trento Department of Philosophy. Areas of interest and research: Ethics, Political Philosophy, Plato, Aristotle, Augustinus, Kant, Nietzsche, Wittgenstein, Heidegger. She is the author of the books Felicita Socratica and Storia Della Felicita (with Guiseppe Farinetti) and of numerous articles in her field. Kevin Mulligan: University of Geneva Department of Philosophy. Areas of interest and research: Philosophy of Mind, Ontology and Philosophy of Logic. He is the author of numerous articles in his field. Stephen Leighton: Queens University Department of Philosophy. Areas of interest and research: Philosophical Psychology, Ethics, Ancient Greek philosophy. He is the author of numerous articles in his field. Walter Cavini: University of Bologna Department of Philosophy. Areas of interest and research: Ancient Greek philosophy, Plato, Aristotle, Zeno, Sextus Empiricus and Ludwig Wittgenstein. He is the author of numerous articles and book chapters in his field. Amy Schmitter: University of Alberta Department of Philosophy. Areas of interest and research: Philosophy of Mind, Metaphysics, Aesthetics, Feminist Philosophy, Aristotle, Locke, Hobbes, Descartes, Leibniz, Spinoza, Marx, Nietzsche, Heidegger, Derrida, Foucault, Althusser. She is the author of numerous articles in her field. John Richardson: New York University (NYU) Department of Philosophy. Areas of interest and research: 19th and 20th century European Continental Philosophy, Ancient Greek Philosophy, Philosophy of Biology, Nietzsche, Heidegger, Darwin and Aristotle. He is the author of the books Existential Epistemology: A Heideggerian Critique of the Cartesian Project, Nietzsches System, Nietzsches New Darwinism, Heidegger and The Oxford Handbook of Nietzsche (with Kenneth Gemes) and also the author of numerous articles. Kenneth Gemes: Birbeck College (London) Department of Philosophy. Areas of interest and research: Philosophy of Science, Philosophical Logic, Epistemology, Nietzsche and Freud. He is the author of the book The Oxford Handbook of Nietzsche (with John Richardson) and the editor of the book Nietzsche on Freedom and Autonomy (with Simon May) and also the author of numerous articles. Alexander Aichele: Martin Luther University Department of Philosophy. Areas of interest and research: Metaphysics, Aesthetics, Ethics, Epistemology, Ancient Greek Philosophy, Hermeneutics, Plato, Aristotle, Kant and Nietzsche. He is the author of the books Philosophie als Spiel: Platon-Kant-Nietzsche and Ontologie des Nicht-Seienden: Aristoteles' Metaphysik der Bewegung and also the author of numerous articles. Örsan K. Öymen: Işık University (Istanbul) Department of Humanities and Social Sciences. (Chairman). Areas of interest and research: Epistemology, Ethics, Scepticism, Existentialism, Sextus Empiricus, Hume, Nietzsche, Marx, Heidegger and Sartre. He is the author and editor of the book Hume and also the author of numerous articles. He is also the founder and director of the project Philosophy in Assos. Christa Davis Acampora: City University of New York Hunter College Department of Philosophy. Areas of interest and research: Modern European Continental Philosophy, Moral Psychology, Political Philosophy, Nietzsche and Heidegger. She is the author of the books Nietzsches Beyond Good and Evil: A Readers Guide (with Keith Ansell Pearson) and Contesting Nietzsche and also the author of numerous articles. Werner Stegmaier: Ernst-Moritz-Arndt University of Greifswald Department of Philosophy. Areas of interest and research: Ethics, Aesthetics, Hermeneutics, Philosophy of Religion, Aristotle, Descartes, Leibniz, Kant, Hegel, Nietzsche, Dilthey, Derrida and Levinas. He is the author of the books Der Substanzbegriff der Metaphysik. Aristoteles - Descartes Leibniz, Bedingungen der Zukunft. Ein naturwissenschaftlich-philosophischer Dialog (with Karl Ulmer ve Wolf Hafele), Philosophie der Fluktuanz. Dilthey und Nietzsche, Wirtschaftsethik als Dialog und Diskurs , Nietzsches Genealogie der Moral, Interpretationen. Hauptwerke der Philosophie. Von Kant bis Nietzsche , Levinas, Philosophie der Orientierung, Nietzsche zur Einführung and Nietzsches Befreiung der Philosophie and also the author of numerous articles. Ivan Soll: University of Wisconsin-Madison Department of Philosophy. Areas of interest and research: Metaphysics, Ethics, Aesthetics, Existentialism, Nietzsche, Sartre, Freud, Hegel, Schopenhauer and Camus. He is the author of the book "Introduction to Hegel's Metaphysics" and also the author of numerous articles. Simon May: Kings College London Department of Philosophy. Areas of interest and research: Ethics, German Idealism, Philosophy of Emotions, Schopenhauer, Nietzsche and Heidegger. He is the author of the books Love: A History , Nietzsche's Ethics and his War on Morality and Thinking Aloud: A Collection of Aphorisms (which received the Book of the Year Price of the Financial Times Newspaper in 2009). He is also the editor of Nietzsche on Freedom and Autonomy (with Kenneth Gemes) and the author of numerous articles. Oruç Aruoba: Areas of interest and research: Epistemology, Ethics, Hume, Kant, Kierkegaard, Nietzsche, Marx, Heidegger and Wittgenstein. He is the author of the books Benlik, Sayıklamalar, Kesik Esintiler, Geç Gelen Ağıtlar, Ol / An, Doğançay'ın Çınarları, Zilif, Çengelköy Defteri, İle İlişki Defteri, Yakın, Ne Ki Hiç Haikular, Tümceler Bir Yerlerden Bir Zamanlar, De ki İşte, Yürüme, Uzak, Hani, Olmayalı, Ne Otuz Altı Tanzaku. He translated Nietzsches Anti-Christ from the German to the Turkish. He is also the author of numerous articles. Gary Shapiro: University of Richmond Department of Philosophy. Areas of interest and research: Ethics, Aesthetics, European Continental Philosophy, American Philosophy, Kant, Nietzsche, Schopenhauer, Hegel, Peirce, Gadamer, Habermas, Derrida and Foucault. He is the author of the books Archaeologies of Vision: Foucault and Nietzsche on Seeing and Saying, Earthwards: Robert Smithson and Art After Babel, Alcyone: Nietzsche on Gifts, Noise, and Women and Nietzschean Narratives and also the author of numerous articles. Rainer Hanshe: Areas of interest and research: Ethics, Aesthetics, Philosophy and Literature and Nietzsche. He is the author of the books The Acolytes and The Abdication and also the author of numerous articles. He is the co-founder of The Nietzsche Circle based in New York. Rainer Hanshe: Areas of interest and research: Ethics, Aesthetics, Philosophy and Literature and Nietzsche. He is the author of the books The Acolytes and The Abdication and also the author of numerous articles. He is the co-founder of The Nietzsche Circle based in New York. David Papineau: Kings College London Department of Philosophy. Areas of interest and research: Metaphysics, Philosophy of Science, Philosophy of Mind, Philosophy of Psychology, Philosophy of Mathematics. He is the author of the books For Science in the Social Sciences, Theory and Meaning, Reality and Representation, Philosophical Naturalism, Introducing Consciousness, Thinking About Consciousness, The Roots of Reason: Philosophical Essays on Rationality, Evolution and Probability and Philosophical Devices: Proofs, Probabilities, Possibilities and Sets and the editor of the books The Philosophy of Science, Philosophy and Essays on Teleosemantics (with Graham Macdonald) and also the author of numerous articles. He served as President of the British Society for the Philosophy of Science and The Mind Association and is currently the President of the Aristotelian Society. Shaun Gallagher: University of Memphis Department of Philosophy. Areas of interest and research: Philosophy of Mind, Phenomenology, Cognitive Science, Hermeneutics, Philosophy of Time. He is the author of the books Phenomenology, The Phenomenological Mind (with D. Zahavi), Brainstorming: Views and Interviews on the Mind, How the Body Shapes the Mind , The Inordinance of Time and Hermeneutics and Education and the editor of the books Oxford Handbook of the Self, Hegel, History and Interpretation, Merleau-Ponty, Hermeneutics and Post Modernism, Does Consciousness Cause Baheaviour? (with W. Banks, S. Pockett), Models of the Self (with J. Shear), Handbook of Phenomenology and Cognitive Science (with D. Schmicking) and Ipseity and Alterity: Interdisciplinary Approaches to Intersubjectivity (with S. Watson) and also the author of numerous articles. Michael Tye: University of Texas (at Austin) Department of Philosophy. Areas of interest and research: Philosophy of Mind, Philosophy of Language and Metaphysics. He is the author of the books The Metaphysics of Mind, The Imagery Debate, Ten Problems of Consciousness: A Representational Theory of the Phenomenal Mind, Color, Consciousness and Content, Consciousness and Persons: Unity and Identity, Consciousness Revisited: Materialism Without Phenomenal Concepts and Seven Puzzles of Thought: An Originalist Theory of Concepts (with Mark Sainsbury) and also the author of numerous articles. Paul Horwich: New York University Department of Philosophy. Areas of interest and research: Epistemology, Philosophy of Science, Philosophy of Language, Philosophical Logic, Metaphysics. He is the author of the books Probability and Evidence, Asymmetries in Time, Truth, Meaning, From a Deflationary Point of View, Reflections on Meaning and Truth-Meaning-Reality and also of numerous articles. Daniel Hutto: University of Wollongong / University of Hertfordshire Department of Philosophy. Areas of interest and research: Philosophy of Mind, Cognitive Science, Philosophy of Psychology, Philosophy of Language. He is the author of the books The Presence of Mind, Beyond Physicalism, Wittgenstein and the End of Philosophy, Folk Psychological Narratives and Radicalizing Enactivism: Basic Minds Without Content (with Erik Myin) and the editor of the books Folk-Psychology Re-Assessed, Narratives and Understanding Persons and Narrative and Folk-Psychology and also the author of numerous articles. Paul Boghossian: New York University (NYU) Department of Philosophy. Areas of interest and research: Epistemology, Philosophy of Mind, Philosophy of Language. He is the author of the books Fear of Knowledge: Against Relativism and Constructivism and Content and Justification: Philosophical Essays and the editor of the book New Essays on the A Priori (with Christopher Peacocke) and the author of numerous articles. Barry Smith: University of London / Birkbeck Department of Philosophy. Areas of interest and research: Philosophy of Mind and Philosophy of Language. He is the author of the books Realism and Anti-Realism: An Enquiry into Meaning, Truth and Objectivity and The Oxford Handbook of Philosophy of Language (with Ernest Lepore) and the editor of the books Knowing Our Own Minds (with Crispin Wright and Cynthia Macdonald ) and Questions of Taste. The Philosophy of Wine and also the author of numerous articles. He prepared and hosted the BBC radio programme Mysteries of the Brain. Bill Wringe: Bilkent University Department of Philosophy. Areas of interest and research: Philosophy of Mind, Philosophy of Language and Philosophy of Science. He is the author of various articles. Gisela Striker: Harvard University Department of Philosophy. Areas of research and interest: Ancient Greek Philosophy, Hellenistic Philosophy, Plato, Aristotle, Stoicism, Epicureanism, Scepticism. She is the author of the book Essays On Hellenistic Epistemology and Ethics and also of numerous articles and book chapters. Carlos Levy: University of Paris-Sorbonne Department of Philosophy. Areas of research and interest: Hellenistic and Roman Philosophy, the relationship between philosophy, literature and religion, Cicero, Seneca, Philo of Alexandria, Sextus Empiricus. He is the author of the books Cicero Academicus, Les Philosophies Hellénistiques, "Le Presocratiques Latins. Heraclite (with Lucia Saudelli), Les Scepticismes , Devenir Dieux and also of numerous articles and book chapters. Michael Williams: Johns Hopkins University Department of Philosophy. Areas of research and interest: Epistemology, Ancient and Modern Scepticism, Philosophy of Language, History of Modern Philosophy. He is the author of the books Groundless Belief, Unnatural Doubts and Problems of Knowledge and also of numerous articles. Richard Bett: Johns Hopkins University Department of Philosophy (Chairman). Areas of research and interest: Epistemology, Ethics, Ancient Greek Philosophy, Plato, Stoicism, Epicureanism, Scepticism, Friedrich Nietzsche. He is the author of the book Pyrrho: His Antecedents and His Legacy and of numerous book chapters and articles and also editor of The Cambridge Companion to Ancient Scepticism. David Wolfsdorf: Temple University Department of Philosophy. Areas of research and interest: Ethics, Philosophy of Language, Philosophical Psychology, Ancient Greek Philosophy, Roman Philosophy, Plato, Aristotle, Epicurus. He is the author of the books Pleasure in Ancient Greek Philosophy and Trials of Reason: Plato and the Crafting of Philosophy and of numerous articles and book chapters. Svavar H. Svavarsson: University of Iceland Department of Philosophy. Areas of research and interest: Ancient Greek Philosophy, Plato, Aristotle, Sextus Empiricus, Scepticism. He is the author of numerous articles and book chapters. Monte R. Johnson: University of California San Diego Department of Philosophy. Areas of research and interest: Ancient Greek Philosophy, Democritus, Aristotle. He is the author of the book Aristotle on Teleology and of various articles. Örsan K. Öymen: Isik University (Feyziye Mektepleri Foundation) Department of Humanities and Social Sciences (Chairman). Founder and Director of the project Philosophy in Assos and Founder and President of the Association of Philosophy, Art and Science. Areas of research and interest: Epistemology, Ethics, Sextus Empiricus, David Hume, Friedrich Nietzsche. He is the author and editor of the book Hume and of numerous articles. Christopher Shields: University of Notre Dame Department of Philosophy. Areas of interest and research: Ancient Greek Philosophy, Aristotle, Metaphysics. He is the author of the books Order in Multiplicity: Homonymy in the Philosophy of Aristotle, Classical Philosophy: An Introduction, Aristotle, Ancient Philosophy: A Contemporary Introduction, The Philosophy of Thomas Aquinas (with Robert Pasnau) and Arsitotles De Anima and also of numerous book chapters and articles in his area. Walter Cavini: University of Bologna Department of Philosophy. Areas of interest and research: Ancient Greek Philosophy, Plato, Aristotle, Stoicism, Scepticism and Ludwig Wittgenstein. He is the author of numerous book chapters and articles in his area. Stephen Leighton: Queen's University Department of Philosophy. Areas of interest and research: Ancient Greek Philosophy, Aristotle, Philosophical Psychology, Ethics. He is the author of numerous book chapters and articles in his area. Katja Vogt: Columbia University Department of Philosophy. Areas of interest and research: Ancient Greek Philosophy, Ethics, Epistemology, Plato, Aristotle, Stoicism, Scepticism. She is the author of the books Belief and Truth: A Sceptic Reading of Plato, Law, Reason and the Cosmic City: Political Philosophy in the Early Stoa and Skepsis und Lebenspraxis: Das Pyrrhonische Leben ohne Meinungen and also of numerous articles in her area. Joachim Aufderheide: King's College London Department of Philosophy. Areas of interest and research: Ancient Greek Philosophy, Plato, Aristotle, Ethics. He is the author of numerous articles in his area. Christiana Olfert: Tufts University Department of Philosophy. Areas of interest and research: Ancient Greek Philosophy, Aristotle, Early Modern Philosophy, Ethics. She is the author of the book Aristotle on Practical Truth (forthcoming) and of numerous articles in her area. Maria Liatsi: University of Ioannina Department of Philosophy. Areas of interest and research: Ancient Greek Philosophy, Ancient Greek Science, Plato, Aristotle, Ethics. She is the author of the books Aristoteles, De Generatione Animalium, Interpretation der Antike. Die Pragmatistische Methode Historischer Forschung and Die Semiotische Erkenntnistheorie Platons im Siebten Brief. Eine Einführung in den Sogenannten Philosophischen Exkurs and of numerous articles in her area. Mehmet M. Erginel: Eastern Mediterranean University Department of Psychology. (M.A. & PhD: University of Texas Austin- Department of Philosophy). Areas of interest and research: Ancient Greek Philosophy, Plato, Aristotle, Ethics. He is the author of numerous articles in his area. 19:00 Temple of Athena: Welcome, blue sea, wine and sun set. Rolf-Peter Horstmann: Humboldt University of Berlin. Areas of interest and research: Metaphysics, Ontology, Epistemology, 18th, 19th and 20th century philosophy, Kant and Hegel. He is the author of the books Hegels vorphänomenologische Entwürfe zu einer Philosophie der Subjektivität in Beziehung auf die Kritik an den Prinzipien der Reflexionsphilosophie, Kritische Darstellung der Metaphysik. Eine Diskussion zu Hegels 'Logik' (with H. F. Fulda ve M. Theunissen), Ontologie und Relationen. Hegel, Bradley, Russell und die Kontroverse über interne und externe Beziehungen, Wahrheit aus dem Begriff. Eine Einführung in Hegel, Die Grenzen der Vernunft. Eine Untersuchung zu Zielen und Motiven des Deutschen Idealismus, Bausteine kritischer Philosophie. Arbeiten zu Kant and G. W. F. Hegel. Eine Einführung (with D. Emundts) and of numerous articles is his area. Frederick Beiser: Syracuse University Department of Philosophy. Areas of interest and research: German philosophy, Kant, Hegel, Fichte, Schelling. He is the author of the books The Fate of Reason: German Philosophy from Kant to Fichte, Enlightenment, Revolution & Romanticism: The Genesis of Modern German Political Thought, 1790-1800, The Sovereignty of Reason: The Defense of Rationality in the Early English Enlightnement, German Idealism: The Struggle against Subjectivism, 1871-1900, The Romantic Imperative: The Concept of Early German Romanticism, Hegel, Schiller as Philosopher, Diotimas Children: German Aesthetic Rationalism from Leibniz to Lessing, The German Historicist Tradition and Late German Idealism: Trendelenburg and Lotze and of numerous articles in his area. Kenneth Westphal: Boğaziçi University Department of Philosophy. Areas of interest and research: Epistemology, Ethics, Political Philosophy, Descartes, Hume, Kant and Hegel. He is the author of the books Kants Transcendental Proof of Realism, Hegels Epistemology: A Philosophical Introduction to the Phenomenology of Spirit, Hegel, Hume und die Identität wahrnehmbarer Dinge and Hegels Epistemological Realism and of numerous articles in his area. Patricia Kitcher: Columbia University Department of Philosophy. Areas of interest and research: History of Modern Philosophy, Kant, Philosophy of Psychology, Freud, Personal Identity. She is the author of the books Kants Transcendental Psychology, Freuds Dream: A Complete Interdisciplinary Science of Mind and Kants Thinker and of numerous articles in her area. Desmond Hogan: Princeton University Department of Philosophy. Areas of interest and research: Early Modern Philosophy, Leibniz, Kant. He is the author of numerous articles in his area. Andrew Chignell: University of Pennsylvania Department of Philosophy. Areas of interest and research: 17th, 18th and 19th century philosophy, Epistemology, Ethics, Aesthetics, Philosophy of Religion, Kant. He is the author of the book What May I Hope? (forthcoming) and of numerous articles in his area. Jan-Willem van der Rijt: University of Bayreuth Department of Philosophy. Areas of interest and research: Ethics, Political Philosophy, Philosophy of Law. He is the author of the book The Importance of Assent: A Theory of Coercion and Dignity and of numerous articles in his area. Lucas Thorpe: Boğaziçi University Department of Philosophy. Areas of interest and research: Ethics, Political Philosophy, Early Modern Philosophy, Kant. He is the author of the book The Kant Dictionary (forthcoming) and of numerous articles in his area. Richard Miller: Cornell University, Department of Philosophy. (Professor). Areas of interest and research: Social and Political Philosophy, Ethics. He is the author of the books Equality, Democracy and National Sovereignty: Reconciling East and West, Globalizing Justice: The Ethics of Poverty and Power, Moral Differences: Truth, Justice and Conscience in a World of Conflict, Fact and Method: Explanation, Confirmation and Reality in the Natural and the Social Sciences, Analyzing Marx: Morality, Power and History and of numerous articles in his area. Tony Smith: Iowa State University, Department of Philosophy and Religious Studies. (Professor). Areas of interest and research: Social and Political Philosophy, Ethics, Philosophy of Technology, Marx, Hegel, Habermas. He is the author of the books Globalisation: A Systematic Marxian Account, Technology and Capital in the Age of Lean Production: A Marxian Critique of the New Economy , Dialectical Social Theory and Its Critics: From Hegel to Analytical Marxism and Postmodernism, The Role of Ethics in Social Theory: Essays from a Habermasian Perspective, The Logic of Marxs Capital: Replies to Hegelian Criticisms, Beyond Liberal Egalitarianism: Marx and Normative Social Theory in the Twenty-First Century and of numerous articles in his area. William H. Shaw: San Jose State University, Department of Philosophy. (Professor Emeritus). Areas of interest and research: Ethics, Social and Political Philosophy. He is the author of the books Marx's Theory of History, Business Ethics, Moore on Right and Wrong: The Normative Ethics of G.E. Moore, Contemporary Ethics: Taking Account of Utilitarianism, Utilitarianism and the Ethics of War and of numerous articles in his area. Andrew Chitty: University of Sussex, Department of Philosophy. (Senior Lecturer). Areas of interest and research: Social and Political Philosophy, Ethics, Rousseau, Kant, Hegel, Fichte, Marx. He is the author of the book Karl Marx and Contemporary Philosophy (with Martin Mc Ivor) and of numerous articles in his area. Karsten Struhl: City University of New York (John Jay College of Criminal Justice) Department of Philosophy. (Adjunct Lecturer). Areas of interest and research: Social and Political Philosophy, Ethics, Epistemology, Marxist Philosophy, Buddhist Philosophy, Chinese Philosophy, Human Nature, Just War Theory, Ecology, Cross-cultural Philosophy and Problems of Revenge and Punishment. He is the editor of various books and also author of numerous articles in his area. Türker Armaner: Galatasaray University, Department of Philosophy. (Professor). Areas of interest and research: Social and Political Philosophy, Aesthetics, Spinoza, Hegel, Fichte, Marx, Schopenhauer, Kierkegaard. He is the author of the books Dalgakıran, Taş Hücre, Kıyısız (short stories), Tahta Saplı Bıçak, Hüküm (novel), Tarih ve Temsil and of numerous articles in his area. Doğan Göçmen: Dokuz Eylül University, Department of Philosophy. (Professor). Areas of interest and research: Social and Political Philosophy, Philosophy of Economics, Hobbes, Smith, Kant, Hegel, Marx, Husserl. He is the author of the books Modern Felsefe: Tarihsel Anlamı, Güncel Mirası; Adam Smith, Hegel ve Marx, The Adam Smith Problem: Reconciling Human Nature and Society in the Theory of Moral Sentiments and Wealth of Nations and of numerous articles in his area. Larry Udell: West Chester State University, Department of Philosophy. (Assistant Professor). Areas of interest and research: Social and Political Philosophy, Philosophy of Law, Philosophy of Economics, Philosophy of Social Sciences. He is the author of various articles in his area. Jan Kandiyali: İstanbul Technical University, Department of Humanities and Social Sciences. (Assistant Professor). Areas of interest and research: Social and Political Philosophy, Ethics, Marx. He is the author of various articles in his area. The meetings of Philosophy in Assos take place in an informal atmosphere where everyone has a chance to express his/her ideas on the relevant topics. Our aim is to increase active interaction as much as possible. In our meetings, we make sure that after the presentation of the speaker, there is also sufficient time for a discussion and dialogue about the ideas expressed by the speaker and that every participant has a chance to express his/her ideas, comments and questions. Each presentation is approximately one hour and there is another one hour time following the presentation for questions, answers and discussion. Those speakers who want their ideas to be known in written form and/or those who believe they can express themselves better by writing may do so if they wish and distribute their written texts and/or a summary of it to the participants before or during the meetings in order to transform ideas into a relatively more permanent form. Most of the participants of Philosophy in Assos are philosophy professors and students from philosophy departments of universities in Europe and North America. But there are also some non-philosopher participants who are interested in philosophy. Some of the professors who took place as speakers at our previous meetings are: Ahmet İnam (METU / Turkey), Pınar Canevi (Boğaziçi University / Turkey), Örsan K. Öymen (Isık University / Turkey), Cemal Yıldırım (METU / Turkey), Eva Picardi (University of Bologna / Italy), Nicla Vassalo (University of Genova / Italy), Amihud Gilead (University of Haifa / Israel), Brian Elliot (University College Dublin / Ireland), Halil Turan (METU / Turkey), Ayhan Sol (METU / Turkey), Türker Armaner (Galatasaray University / Turkey), Cengiz Çakmak (Istanbul University / Turkey), Cemil Güzey (Mimar Sinan University / Turkey), Sezgi Durgun (Marmara University / Turkey), Bülent Gözkan (Yeditepe University / Turkey), Yaman Örs (Ankara University / Turkey), Sinan Özbek (Kocaeli University / Turkey), Güven Güzeldere (Duke University / USA), David Cooper (University of Durham / UK), Asa Kasher (Tel Aviv University / Israel), Gary Banham (Manchester Metropolitan University / UK), Alan Kim (University of Memphis / USA), Gerrit Steunebrink (Nijmegen University / Netherlands), Stephen Stich (Rutgers University / USA), Paul van Tongeren (Nijmegen University / Netherlands), Stephen Laurence (University of Sheffield / UK), Geraldine Coggins (University of Aberdeen / UK), Walter Cavini (University of Bologna / Italy), Orly Shenker (Open University of Israel / Israel), Erdinç Sayan (METU / Turkey), Gisela Striker (Harvard University / USA), Julia Annas (University of Arizona / USA), Richard Bett (John Hopkins University / USA), James Allen (University of Pittsburgh / USA), Matthias Bormuth (University of Tuebingen / Germany), Charlotte Witt (New Hamsphire University / USA), Sylvana Chrysakopoulou (University of Patras / Greece), David Owen (University of Arizona / USA), Tito Magri (University of Rome / Italy), Don Garrett (New York University / USA), Colin Howson (London School of Economics / UK), Ulrich Haase (Manchester Metropolitan University / UK), Clare Carlisle (University of Liverpool / UK), Marc Sinclair (Manchester Metropolitan University / UK), Ulrich Steinvorth (Bilkent University / Turkey), Iddo Landau (University of Haifa / Israel), Keith Crome (Manchester Metropolitan University / UK), Christof Rapp (Humboldt University Berlin / Germany), Christoph Horn (Bonn University / Germany), Pierre Destree (University of Louvain / Belgium), Anthony Price (Birbeck College London / UK), Dan Russell (Monash University / Australia), Phillip Brüllmann (Humboldt University Berlin / Germany), Christopher Gill (University of Exeter / UK), Jean Salem (University of Paris 1 Sorbonne / France), Amber Carpenter (University of St Andrews / UK), Dogan Ozlem (Mugla University / Turkey), Oruc Aruoba (Hacettepe University / Turkey), Baris Parkan (METU / Turkey), Cetin Turkyilmaz (Hacettepe University / Turkey), Pascal Engel (University of Geneva / Switzerland), Ivan Soll (University of Wisconsin-Madison / USA), Toni Ronnow-Rasmussen (Lund University / Sweden), Fulvia De Luise (University of Trento / Italy), Kevin Mulligan (University of Geneva / Switzerland), Stephen Leighton (Queens University / Canada), Amy Schmitter (University of Alberta / Canada), Taylan Altuğ (Ege University / Turkey), Aydan Turanlı (Istanbul Technical University / Turkey), Chryssi Sidiropoulou (Boğaziçi University / Turkey), Sibel Oktar (Ozyegin University / Turkey), Simon Blackburn (Cambridge University / UK), Stephen Darwall (Yale University / USA), John Prentice Wright (Central Michigan University / USA), David Owen (University of Arizona / USA), Don Garrett (New York University / USA), Paul Russell (University of British Columbia / Canada), William Edward Morris (Illinois Wesleyan University / USA), Charlotte Brown (Illinois Wesleyan University / USA), Michael B. Gill (University of Arizona / USA), Tito Magri (University of Roma La Sapienza / Italy), Mete Tunçay (Bilgi University / Turkey), Dorothea Frede (University of California - Berkeley / USA), Michael Pakaluk (The Institute for the Psychological Sciences at Arlington / USA), Andres Rosler (University of Buenos Aires / Argentina), Marguerite Deslauriers (University of McGill / Canada), Marco Zingano (University of Sao Paulo / Brazil), Afşar Timuçin (Kocaeli University / Turkey), Turhan Ilgaz (Istanbul University / Turkey), Sabri Büyükdüvenci (Ankara University / Turkey), Kaan H. Ökten (Kemerburgaz University / Turkey), Elif Çırakman (METU / Turkey), Nebil Reyhani (Mugla University / Turkey), Özge Ejder Johnson (Yeditepe University / Turkey), Jan Robert Bloch (Potsdam University / Germany), Alan Carter (University of Glasgow / UK), Sandrine Berges (Bilkent University / Turkey), Minou Friele (Heinrich-Heine University / Germany), Uluğ Nutku (Cumhuriyet University / Turkey). Philosophy in Assos is organized by the Association of Philosophy, Art & Science. The costs of organizing Philosophy in Assos are covered through the donations and membership fees in the budget of the association. Membership fees are pretty symbolic and represent a very low percentage of the total budget. Thus the association depends heavily on donations and organizes its events through these donations. Each participant is free to determine the amount he or she wishes to donate. We hope all participants will be sensitive and understanding about this issue. For those who wish to make a donation, we will inform you as to the procedure of making the donation after your registration. Donations are not obligatory. Participants will be responsible for all their expenses including accommodation, transportation, food and drinks. We may have a limited number of free rooms available for professors who travel from abroad. There is also a possibility of free camping. If you are interested, please inquire by writing to aristotle@philosophyinassos.org. We also assist all participants from abroad professors, students, graduates with their reservations for accomodation. Payments for accommodation may be made when checking out. "Philosophy In Assos" is not involved in the payment process and takes no responsibility for it. Room rates (without the discount) range from $10 to $70 per night including breakfast. The guest houses in the village are usually less expensive than those at the sea side although there are also some hotels and guest houses at the sea side that offer rooms for approximately $30 to $50 per night including breakfast. All rooms are clean regardless of the price. A meal costs between $5 and $40. One bottle of wine is approximately $10 in a shop and $20 in a restaurant. ATM machines in Turkey are widespread and credit cards are also accepted in most places in Turkey, however some hotels and restaurants in Assos do not accept credit cards. There are no ATM machines and banks in Assos; it is necessary to drive 30 minutes for an ATM machine and a bank, either to Ayvacik or to Kucukkuyu. It is possible to change Dollars, Euros and Pounds into Turkish Lira's in all the banks; some hotels in Assos change foreign currency as well, but with a lower rate compared to the banks, so it is recommended that you change your currency before your arrival to Assos. Overseas communication facilities (telephone, fax, internet etc.) in Turkey are widespread and efficient. However internet facilities in Assos are limited. Assos is located in Turkey in the province of Çanakkale on the Aegean coast. It is a 6-7 hour busride from Istanbul, the largest city in Turkey, where daily world wide airline connections are available. It is a 3-4 hour busride from Izmir which is the third largest city in the country and has international flight connections as well. Busses to the province of Çanakkale depart from the central bus stations in Istanbul and Izmir. The connection point for Assos on the main highway is the town of Ayvacik in the province of Çanakkale. 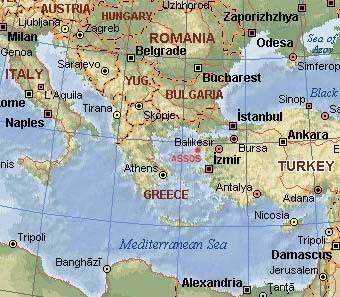 (Not to be confused with Ayvalik which is in the province of Balikesir). Those taking busses from Istanbul or Izmir must buy a ticket to Ayvacik/Çanakkale. Ayvacik is a half hour drive from Assos and there are regular public transportation vans as well as taxis from Ayvacik to Assos. There are daily direct flights to Istanbul from New York City and all major European cities. (Most of the Izmir connections are via Istanbul). All major European airline companies including British Airways, Lufthansa, Air France, Alitalia, Iberia, Scandinavian as well as Turkish Airlines fly daily to Istanbul. Turkish Airlines has direct flights to Istanbul from New York City every day and from Chicago and Miami at least two days a week. For more information about US flights, contact the Turkish Airlines offices in NYC, Chicago or Miami. From Greece, Assos may be reached via the island of Lesbos or the island of Chios. There is a daily boat from Lesbos (from the town of Mitillini) to Ayvalik (in the province of Balikesir) which is a 1-2 hours trip. The bus ride from Ayvalik/Balikesir to Ayvacik/Çanakkale is another 2 hours. The Lesbos connection is the shortest way to reach Assos via Greece. Those coming from Chios may take the daily boat to Çesme. The bus ride from Çesme to Izmir is half an hour. The trip from Izmir to Ayvacik/Çanakkale as indicated above is 3-4 hours. There is a daily sealine connection from all the Greek islands in the Aegean to Lesbos and Chios. There are also daily flights to Lesbos and Chios from Athens. "Philosophy In Assos" will provide free assistance with accommodation reservations in Assos as well as organize your direct transfer from the airport to Assos via a rent-a-car with a driver for those who do not wish to take a bus. (The price is approximately 250 US dolars from Istanbul and about 150 US dolars from Izmir). If you decide to stop in Istanbul or Izmir we can also assist you with reservations and provide information about historic and scenic places to visit. Hotel prices range from $40 to $500 in Istanbul and $40 to $300 in Izmir per night including breakfast. (We cannot guarantee a discount for hotels in Istanbul and Izmir). Please be sure to include 1) your daily accommodation budget for Assos and, if applicable in Istanbul or Izmir and 2) your arrival/departure dates to/from Istanbul, Izmir and Assos when you fill out the registration form. For more information about Assos, visit Assos.de and www.assos.org. It is necessary to implement an application and registration procedure in order to avoid any organizational and conceptual inconveniences. Everybody interested in participating in the meetings must apply beforehand. To apply, fill in the form and send a confirmation message by e-mail to aristotle@philosophyinassos.org. After receiving your application, we will send you a confirmation message to let you know you have been registered on our list of participants. The sooner you apply, the better the chance of your application being accepted. Remember, we can only accept a limited number of people. Also, if you don't hear from us within four weeks, it probably means there were some technical problems. If this occurs, please e-mail us again. Including Philosophy in Assos, all events of the association are organized with the support of donations. (See Expenses). Those who wish to make a donation will be informed about the procedure as to how to make the donation after registration. The final application deadline for the February 1-2, 2019 meeting is January 30, 2019. All interested parties may apply. If you are a philosophy student, teacher or graduate, please be sure to include your university when you fill out the application form. Please fill out this form as completly as possible. The deadline is January 30, 2019. Örsan K. Öymen, founder and director of Philosophy In Assos was born in Berlin in 1965. He received his basic education in T.E.D. Ankara Koleji and Bonn American High School. After school he decided to study philosophy and entered the Middle East Technical University (M.E.T.U.) in Ankara, one of the leading universities of Turkey. He graduated from the Department of Philosophy at M.E.T.U. in 1987. He continued his studies in the United States and received his M.A. degree in 1990 from the Department of Philosophy at New York University (N.Y.U.). The topic of his master thesis was "David Hume's Problem of Induction". After returning to Turkey he started his doctoral studies at the philosophy department in M.E.T.U. and received his Ph.D. degree from there in 1999. He wrote his Ph.D. thesis on "Sextus Empiricus' Problem of Criterion". His areas of interest and research are: Epistemology, Ethics, Political Philosophy; Pyrrho, Aenesedimus, Sextus Empiricus, David Hume, Friedrich Nietzsche, Karl Marx, Martin Heidegger, Jean-Paul Sartre. He is currently Professor at Isik University and President of the Association of Philosophy, Art and Science both based in Istanbul. He came up with the idea about Philosophy In Assos during his student years at METU and started the project in September 2000. The meetings of Philosophy in Assos are organized by the Association of Philosophy, Art and Science. The team under the direction of Örsan K. Öymen, the President of the association, consists of Sırrı Küçük (General Secretary), Beratiye Şener (General Accountant), Alparslan Esmer (Member), Anıl Ünal (Member), Burak Erbora (Member), Kerem Savaş (Member) Burak Kesgin (Member), Onur Peştimalcioğlu (Member), Baver Demircan (Member) and Güler Cemre Şen (Member). The international contact people of Philosophy in Assos are: Walter Cavini (Italy), Brian Elliott (USA), Pierre Destree (France and Belgium), Amber Carpenter (United Kingdom), Dagmar Borchers (Germany), Orly Shenker (Israel), Sylvana Chrysikopolou (Greece).